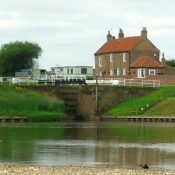 The North Yorkshire Waterways include the Rivers Aire, Ouse, Ure and Foss and the Ripon and Selby Canals. The Ure and the Ouse are the same river, with its name changing two miles upstream of Linton Lock. The navigations above York connect with the rest of the national waterway network by way of the tidal River Ouse and the Selby Canal. The Selby Canal links via the non-tidal River Aire to the Aire and Calder Navigation.